Shares of Research in Motion Ltd. hit an eight-year low Thursday and have fallen more than 15 percent in the past three days, after the company unveiled a prototype BlackBerry with new software. THE SPARK: The prototype has caused angst for BlackBerry users and RIM investors. When new chief executive Thorsten Heins unveiled a touchscreen prototype Tuesday at RIM's annual BlackBerry World conference in Orlando, Fla., he gave no new timetable on when the much-delayed devices will be released. Then on Wednesday, he had to reassure anxious BlackBerry users that RIM will keep making models that include a physical keyboard. He stressed that the device and new software is not the final product. Heins also didn't announce any licensing partnerships. Some investors want RIM to generate more revenue by licensing products, like its popular BBM messenger service, to other carriers. Jefferies analyst Peter Misek said Wednesday night that Heins said he would wait to see what kind of demand there was for BlackBerry 10 before pursuing possible licensing deals. THE BIG PICTURE: The once iconic company is caught in a tough spot. 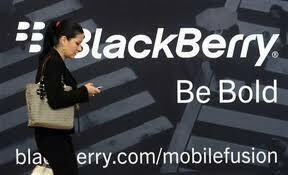 It needs to get out its new software platform, the BlackBerry 10, while continuing to sell current models. But sales have slumped, and are likely to be pressured further as shoppers wait for the newest software to go on sale. RIM has had difficulty competing in the United States with flashier, consumer-oriented touchscreen phones such as Apple Inc.'s iPhone and models that run Google Inc.'s Android software. Analysts say RIM's future depends on BlackBerry 10, although many say it may come too late. RIM has been undergoing a comprehensive strategic review for the last three months. The ANALYSIS: Misek said that the fact that RIM released a prototype now means the new BlackBerrys won't be out until the end of the year. Colin Gillis, an analyst with BGC Financial, said it could be a year before there are any signs that RIM's new BlackBerry 10 software is winning customers. Gillis also faulted the company on its communications strategy, saying that RIM could have prevented BlackBerry subscribers from worrying if there would be a physical keyboard on some of the new BlackBerry models. SHARE ACTION: RIM shares fell 70 cents, or 5.4 percent, to $12.10 in afternoon trading on the Nasdaq. The shares have lost almost three-quarters of their value over the past 12 months, and bottomed at $11.92 on Thursday, their lowest point since January 2004.